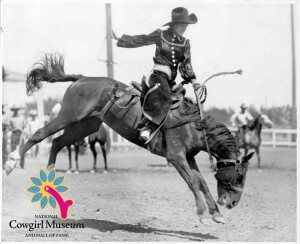 Vaughn started her rodeo career in 1926 as a trick rider to fill in for her sister, Gene. She became one of the top bronc riders and one of the first women to bulldog a steer from a moving car. In the 1930s, Vaughn was one of the few women producers in rodeo, even putting on a 1942 event at the Paris, Texas, fairgrounds, one of the first all-girl rodeos.